Venezuelan expats watch video of anti-government protesters in Caracas on Saturday at City Place in Doral. Yanez’s defection capped an extraordinary two weeks of domestic and international pressure on Maduro, which has raised hopes that the socialist president may finally be forced from power. And it was why Venezuelan expats were feeling unusually festive Saturday evening as they gathered at City Place in Doral for a pro-democracy rally, an event coincided with large-scale anti-Maduro marches in Caracas and across Venezuela. An ensemble playing joropo, traditional Venezuelan music, at Saturday's pro-democracy rally in Doral. In 2014 Marrero, now a life energy coach in Miami, joined the more than three million Venezuelans who’ve left their country in recent years. She became an opposition activist here in no small part because her father was a Cuban exile who died without seeing his native country freed from communism – a fate she said she doesn't want for herself. In front of the stage, Venezuelan-American restaurateur Robert Barany agreed that this moment is different. Venezuelan telenovela actress Belen Marrero welcomes expats to City Place in Doral on Saturday. Barany left Venezuela when Hugo Chávez and his socialist revolution came to power in 1999 because, he said, he could see dictatorial abuses on the horizon. And lately he’d begun to think his homeland was indeed lost to him. But now that the U.S. and much of the international community have declared Maduro’s re-election constitutionally illegitimate, Barany feels buoyant. Cautiously buoyant. Nearby, Luis Gomez was wearing a Venezuelan flag as a cape. “I went to Venezuela this past December,” Gomez said, “and the people, the faces, the feeling – y’know, everyone was sad. Gray. No hope. Gomez, a civil engineer in Weston, was born in Barquisimeto, Venezuela, and his parents brought him and his sister here more than a decade ago as kids. But Gomez’s dad hasn’t abandoned Venezuela. He still has a cheese company there and returns regularly to check up on its operations. 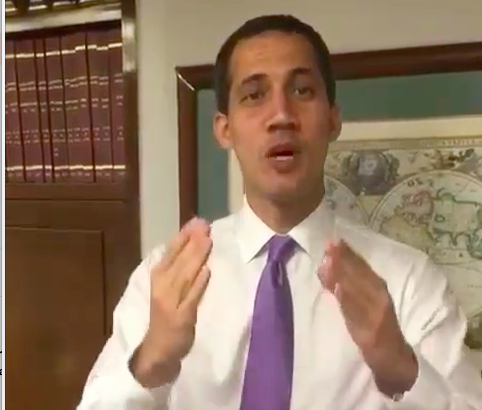 Gomez, who today is 25, said he’s looking forward to going back to help him run the firm – especially since opposition leader Guaidó, only 35 himself, promises to bring a younger, fresher leadership to the forefront. The situation, however, is more complicated for expats like Selene Jurado. “I haven’t seen my parents since I came here seven years ago,” says Jurado, a 25-year-old paralegal in Miami Lakes whose mother and father, both in their 70s, sent her here to study seven years ago. Two years ago they began to miss her and other expat family members so badly they joined anti-government marches in Caracas, hoping to help bring down Maduro. One day, Jurado said, they were almost killed when they got trapped between demonstrators and soldiers’ rifle shots. Since then they’ve moved to Spain. Like most of the expats in City Place on Saturday, Jurado was heartened when Guaidó appeared on a large screen above the plaza addressing them personally. Even if it may take time – perhaps months, as Barany said – for the regime’s cracks to grow large enough to make that happen. Venezuelan opposition leader Juan Guaido addressing expats by video on a large screen in City Place in Doral.